Fola’s research, which she was able to pursue as the recipient of a Summer Student Research Scholarship from Imhotep’s Legacy Academy (ILA), centred specifically around identifying ways to test a device designed to help alleviate the negative physical effects of cell phone use on the neck by improving posture. In addition to generating useful data for the Cape Breton company behind the apparatus, the project also provided the 20-year-old with a crash course in engineering and what it’s like to work on multidisciplinary research. This weekend, Fola joins friends, students and other researchers of African descent on campus for the first annual Black Research Symposium, where she’ll do a poster presentation based on the project. Organized by a handful of student and advocacy organizations, including Dal's own PLANS (Promoting Leadership in health for African Nova Scotians), the two-day event aims to encourage more current Black students to pursue graduate studies by showcasing Black scholarship and research from various disciplines. “Sometimes it’s not common that you see other Black academics and scholars, so I’m really looking forward to meeting with them and talking with them,” says Fola. The symposium will feature a professional network night Friday, Feb. 9, which includes remarks from Ivan Joseph, Dal’s vice provost of student affairs. The following day includes guest speakers, poster presentations (including Fola’s) and a 3 Minute Thesis style segment. Fola says she’s also looking forward to hearing more about their experiences in the research world. Fola’s own foray into research followed an independent study and literature review with Janice Moreside, a researcher in the School of Health and Human Performance. Born and raised in Halifax, Fola is the daughter of Nigerian immigrants who came to Nova Scotia more than 20 years ago. She first took an interest in health-related topics when she was 15, an enthusiasm her parents encouraged at home school. 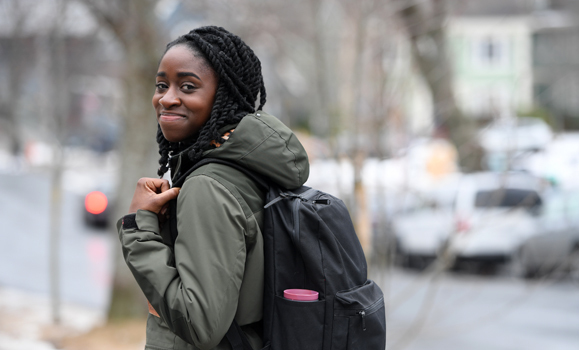 “My parents prepared me very well for university life, so it’s been a pretty smooth transition,” she says, noting she was home schooled from primary all the way through Grade 12. Her involvement with Imhotep’s Legacy Academy began in her first year at Dal when she took on a role making science projects for use in programming aimed at interesting junior high and high school kids of African descent in science, technology, engineering and mathematics (STEM) fields. And this year she took on the role of president of Imhotep’s Learning Community, a new branch of the group for current Dal students that holds educational and de-stressing events. 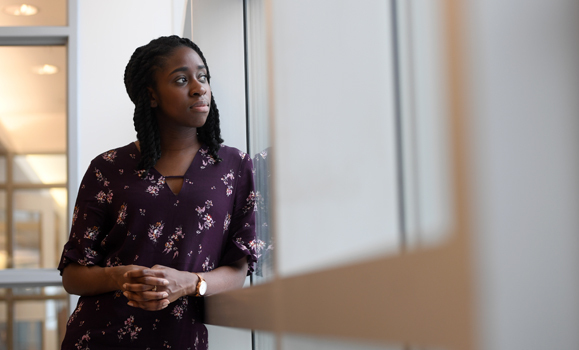 As Fola looks ahead to her final year, she says she plans on doing her honours and on continuing her research on neck-related issues — only this time with an eye to another tech topic: virtual reality. “The idea right now, still in its infancy, is looking at elderly adults and using VR as a way to increase their mobility,” she says. The Black Research Symposium takes place at Dalhousie this Friday, Feb. 8 and Saturday, Feb. 9, at Dalhousie. For more information, visit the PLANS event page.